Chris Rast is a three-time Olympian and professional sailor based in Switzerland. Along with sailing fast boats and having as much fun as he can, Rast has a new role as Quantum’s Melges 24 Class Expert. Chris Rast was born in the U.S. to American parents, but has lived in Switzerland since he was two years old. His first Olympic campaign in 1996 was in the 470, followed by two more Olympic appearances in the 49er, one sailing for Switzerland, and one for the U.S. For the past 10 years, he’s been sailing the Melges 24, and now takes on a new role as Quantum’s Melges 24 Class Expert. In this Q&A, we talk to Chris about his work to promote the fleet, how to have more fun in the Melges 24, and earning bragging rights. Quantum: Melges 24 Class Expert is a pretty official-sounding title. What will this new role entail? Chris Rast: My involvement with the Melges 24 goes about 10 years back when I started sailing with a fully professional Swiss team. I’ve always been in love with the boat. I think the boat is one of the greatest designs out there, for the performance factor and the fun factor. It’s a great team boat, and last year our team won the worlds. We’re going to make a big push to promote the class, doing all sorts of promotional work, especially in Europe. I will be going to most of the Melges 24 events, along with my team and my wife Dani who is part of Swiss Performance Sailing, to host clinics and do other types of promotional work. Quantum is really trying to support the Melges 24 class, especially the Corinthian teams and people who are new to the class. They want to make it easy for people to get into the Melges 24 and do well. Q: What are you most looking forward to with this new role? CR: The class lives and dies not by the professionals or the top teams, but those teams that make up the middle of the rankings: The new teams that get into it, and the teams that like to go out and sail and to have fun, but need a little bit of help to get better. We really want to support the Corinthian teams, and the teams that need a little bit of advice to do well around the racecourse and have more fun. Because guess what—winning is more fun than losing. I really like helping teams and helping them get better. That’s what I’m really looking forward to. Q: What are the steps you take when working with a new boat? CR: It’s all about analyzing the dynamics of the team. Every team’s a little bit different; they have different strengths and weaknesses. We need to figure out where we can have a maximum impact—maybe for one team it’s how to set up a boat, for another team it might be technique or maneuvers, and for other teams it might be tactics and strategy. I try to figure out where the deficiencies are in a team, and come up with a plan to improve in those areas. Q: In the Melges 24, with it being such a strict one-design class, is there a right way and a wrong way to do things? CR: Yes, I would say so. Every crewmember adds to the mechanics of the boat. Sometimes they just have the wrong crewmembers in the wrong positions. Maybe one crewmember is stronger than the other, or another is better at multitasking and needs to be on the bow instead of the middle of the boat. It’s a lot about figuring out the mechanics of the team and letting everybody use their strengths. Q: You’re a former Olympian in the 49er, what do you feel like that experience or your other early sailing experience gave you coming into the Melges 24? CR: You know it really is a bit of a natural fit because the 49er is an asymmetrical boat, so that really helped me with the downwind sailing on the Melges 24. On the other hand, with upwind sailing it was more my 470 background that helped me. So that combined, it was a very easy fit to sail Melges 24s. CR: I started off with the junior coaching and moved into Olympic class coaching. I was the Olympic coach for the Swiss team in 2000 for the games in Sydney. We missed out on the spot in the 49er; we were second in the trials. But since there was a limited amount of coaching credentials, they chose me as their coach. I had a ton of experience sailing in Sydney and I spoke English, I knew the area, and the sailors trusted me and respected me. That’s how I got into higher level coaching. But my primary goal is still to sail and have fun and help people, and when I can I do a little bit of coaching. 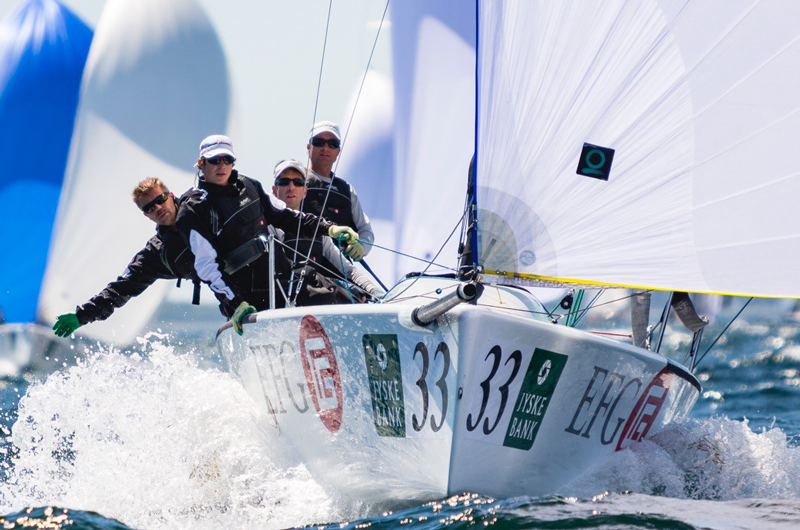 Q: The Melges 24 is such a strict one-design fleet and it’s been around for 20-some years. Why should people come into the class now? CR: Since its inception, the Melges 24 has been such a fun boat to sail in regards to its performance. It goes well upwind, and downwind it’s a hoot. The last day at Key West Race Week, we had big wind and huge waves, and we were just ripping around, ploughing through waves and planning. If you are looking for a class where you get to sail not only against other Corinthian teams, but also against fully professional teams, people like Jimmy Spithill, Vince Brun, Morgan Larson, Terry Hutchinson—you want to get on the same starting line as Terry Hutchinson? Get yourself a Melges 24 and you can go against the world’s best. That’s a very cool thing. You can go out with your friends, do well, beat guys like Terry Hutchinson, or myself, be proud of it, and brag about it at the bar. Q: How can a team get your help? CR: Anybody can reach me via email to ask questions. They can go onto the Quantum website for my contact and we’re working on getting something up on the Melges website too. If you have questions just shoot me an email and I’ll answer as best as possible. Q: What’s your next stop? Apart from Melges 24 sailing, I also do a full Melges 20 campaign in Europe, on a boat called Section 16, owned by Richard Davis. The season starts at the Monaco Winter Series in February, which will be cold probably, but we’ll warm up at the fire in the casino in the evening. Look for Chris Rast at Melges 24 events around the world, and in instructional videos that will be posted on the Quantum website. If you have a question for Chris about the Melges 24, click here.